The second time I saw 5 Seconds of Summer, a mere 24 hours after the first time, I knew what to look forward to. However, the contrast between their House of Blues set and their Rose Bowl set were quite stark, as they reined in the performance I was so suddenly aware they were capable of. This time I saw 5 Seconds of Summer-- at the second of their two night engagement at Los Angeles’ The Forum-- the four Aussies proved that they shine brightest when they are at the top of the bill. While the setlist is certainly a winner, combining favorites from their debut album, EPs and a few covers, the moment of the night that really seemed to get the crowd going was their take on Green Day’s ‘American Idiot.’ The band unleashes a torrent of energetic guitars and hard hitting drums unlike anything else that is featured on their set and it seriously gets the crowd going. Of course, that isn’t to say that the band’s own songs don’t elicit an ear drum shattering response from their fans, as there wasn’t a moment during the entirety of the show that the audience quieted down. Now, it would be remiss not to mention what I found to be the coolest part of the evening, and that was when guitarist Michael Clifford actually asked the audience who would like to come up and play guitar. Most bands wouldn’t do that, let alone a band playing an arena, yet there they were, inviting one lucky audience member up on stage to take over on guitar for a little. It was a pretty awesome moment, one that hopefully remains a part of the performance throughout the rest of the tour next year. Obviously, we at Alter the Press! 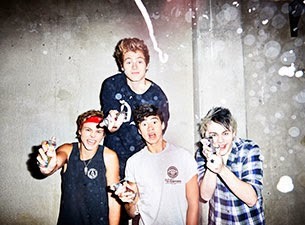 really like 5 Seconds of Summer. (Dare we say love? Would love be too strong of a word? May we wax poetic about our love for you, 5SOS? Are we at that point in our relationship?) So it is with complete adoration when we say that sure, there are moments when a singer may fall a little flat or things don’t seem to mesh quite right, but that is all something that comes with age and practice. What is a live show without a minor hiccup every once and awhile. But even with moments where the vocals may not have necessarily been at their prime, guitars cut out and microphones failed, they were far outweighed and outshined by the great moments. Not only can we not wait to see them again next year, because yes we are already planning on seeing them next year, but we cannot wait to experience the growth they are likely to do between now and when that happens.